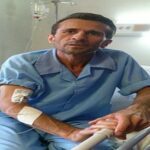 HRANA News Agency – Jafar Azimzadeh, imprisoned labor activist who was released on furlough after 64 days of hunger strike was hospitalized in Ateyeh hospital due to his critical condition. 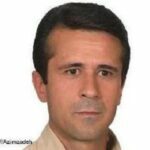 HRANA News Agency – Jafar Azimzadeh, jailed trade unionist was sent to furlough by end of his hunger strike and promised an investigation into the case, after 64 days of hunger strike on June 30. Probably the labor activist will be admitted in another hospital due to his physical condition’s deterioration by his family’s decision. 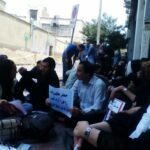 HRANA News Agency – On June 29, Jafar Azimzadeh’s relatives and colleagues held a rally in support of the imprisoned worker who had spent 64 days on hunger strike in front of the President’s Office (Pasteur St). HRANA News Agency – Abbas Jafari Dowlatabadi, Tehran’s prosecutor after accepting to meet the wife of Jafar Azimzadeh, secretary of the board of the Free Trade Union of Workers in Iran imprisoned at Evin Prison on 59th day of hunger strike, told her that he would do nothing for her husband even if he dies, yesterday. HRANA News Agency – At least eight prisoners of conscience namely Ehsan Mazandarani, Jafar Azimzadeh, Maryam Naghash Zargararn, Mohammad Sediq Kaboudvand, Rasoul Razavi, Heshmatollah Tabarzadi, Mohammad Abdollahi and Ayat Mehr Ali Beygloo are still on hunger strike in various prisons in protest to their situations. The physical condition of some of them has deteriorated. On the one hand doctors of Taleghani Hospital are trying to stop Mohammad Sedigh Kaboudvand’s Potassium shortage. On the other hand, Jafar Azimzadeh was transferred to the Shohada Hospital on June 1, 2016 following the deterioration of his condition. 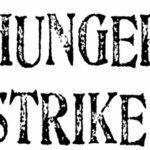 Moreover, the prisoners, Arash Mokri and Mohammad Amin Agoshi also were on hunger strike last month, but the continuation or end of their strike is not known. 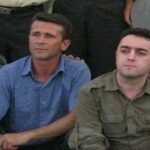 HRANA News Agency – Jafar Azimzadeh secretary of the board of the Free Trade Union of Workers in Iran imprisoned at Evin Prison was taken to hospital on May 21, 2016, following the deterioration of his health condition on the twenty-third day of his hunger strike. HRANA News Agency – Jamil Mohammadi, board member of the Free Trade Union of Workers in Iran, was tried in branch 15 of Tehran Revolutionary Court on Sunday morning, 8th February, also, Jafar Azimzadeh, labor activist was summoned to court, by subpoena. HRANA News Agency – Jamil Mohammadi, the board member of Free Union of Iranian Workers and the coordinator of workers petition, has been released from prison.